The Institute held many lectures every year. Lectures included: A course of eight lectures on Modern European history given by CH Pearson, fellow of Oriel College, Oxford, late Professor of Modern History, King's college London, 1871. In 1866 the list of lectures included: "Ghosts, Faries and Witches" by the Rev M Macfie. "Some of the English authors of the 18th century" by The Rev John Gill. "Love Courtship and Marriage" by the Rev N Haycroft. Many people in the Town and surrounding villages wanted entertainment rather than lectures. 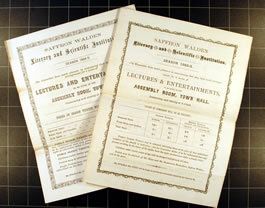 The Institute needed money, so they started annual entertainment programmes in the winter months.